And a few stray thoughts for yet another Saturday. For a Saturday following the week when it looks as though the sun will set on the brief political career of Sidharth Kuncalienker. For a Saturday following the week when a complaint has been filed with the EEC that the BJP is using the ashes of the late Manohar Parrikar to campaign for the party. For a Saturday following the week when confusion persists on who ordered the purification ceremony in the Kala Academy where Manohar Parrikar’s body was kept. For a Saturday following the week when the MGP and the BJP were on the verge of a split over Deepak Dhavalikar contesting from Shiroda. For a Saturday following the week when Babush Monserrate might emerge as king maker of not just Panjim but the next Goa government. For a Saturday following the week when property prices are shooting up in Goa as NRIs and rich bhailes are willing to buy super luxury villas even costing `10 crore each. And a few stray thoughts on the sun setting on the political ambitions of Sidharth Kuncalienker. The son of the former Cumbarjua MLA rose very rapidly in the party as the special assistant of the late Manohar Parrikar. So much so that even though he was not an MLA and did not hold any position in the party, he was appointed vice chairperson of Goa Infrastructure Development Corporation and chairman of EDC. He lost the job as chairperson of EDC when Subhash Shirodkar of the Congress party defected to join the BJP and had to be rewarded. Sidharth has now begun to realize that it is not enough to be a good chamcha of the chief minister, past or present. In fact, his arrogance has made him many enemies. He was so close to Manohar Parrikar that defying the high command Parrikar insisted on making him the candidate for the Panjim Assembly seats when he resigned to join the Central government as defence minister. Sidharth was almost defeated by Babush Monserrate in the by-elections caused by the vacancy in Panjim due to the late Parrikar moving to the Centre. Incidentally, the late Parrikar was elected to the Rajya Sabha from the Lucknow constituency when he became defence minister. The condition imposed by the Election Commission is that anybody can become a minister even if he is not elected both at the State and the Centre. However he has to be elected to Parliament within six months of his being sworn in as minister. Maybe Sidharth Kuncalienker would have still got the ticket for the Panjim Assembly constituency. Though the Election Commission has not confirmed that polls for Panjim will be held along with the polls to the three other constituencies of Mapusa, Shiroda and Mandrem, lobbying has started. The entry of Babush Monserrate into the fray has upset any remote chance of Sidharth getting the BJP ticket. Babush is seen as very difficult to defeat as he controls the CCP and also the Taleigao Panchayat — some parts of which are included in the Panjim constituency. The BJP think tank has decided that Utpal Parrikar, son of late Manohar Parrikar would be the only candidate who can take on Babush Monserrate. There has been tremendous pressure on the family to continue the legacy of Manohar Parrikar. Initially, the family was not inclined to contest the Panjim polls. Like Parrikar himself who was not interested in politics, Utpal, who has an engineering degree from the States is even less interested. He is a quiet man who runs an industrial unit in the Verna Industrial Estate. Friends who run units in the Verna Industrial Estate have a very good opinion of him as he does not do any Parrikargiri and shares lunch with others in the Verna industrial canteen which is middle class. But Utpal may not have any choice and may be pushed into politics just as Velingkar admits it was he who pushed Manohar Parrikar into politics initially from Mapusa where he lost. Subsequently, Velingkar, who was then the supreme boss of the RSS and created the BJP of Goa asked Parrikar to contest from Panjim. Even though Parrikar was unknown in Panjim the educated class decided to vote for him, because he had a degree from the Indian Institute of Technology and was very different from other politicians. The Congress had won the Panjim seat in the early ‘90s when JB Gonsalves was elected. From 1994 onwards Parrikar was continuously elected from Panjim except for the election when he went to Delhi as defence minister. The BJP is hoping there will be a sympathy wave in favour of Utpal. Utpal’s uncle, who is a very big wholesale daru dealer, has come out openly and said that if the party needed him Utpal might contest to keep the legacy of Manohar Parrikar alive. And a few stray thoughts on the BJP using Manohar Parrikar as their mascot in the elections to the five Assembly seats and the two Lok Sabha seats being held in Goa. In Goa nobody bothers about Narendra Modi or Amit Shah. On the contrary everyone is angry with Narendra Modi because he did not fulfil the promise of giving special status to Goa which he had made on the eve of the 2014 election. Goenkars are also angry because Modi and Amit Shah, despite promises, have not done anything about the revival of mining in Goa. However much Modi might try to project himself as the superman who taught Pakistan a lesson with the bombing of Balakot, the hideout of terrorists, for Goans it is the first surgical strike that made an impact. In the case of the first surgical strike when Parrikar was the defence minister there was evidence that the surgical strike was successful. It was carried out by the army and all the soldiers came back safely. However, in the case of the recent air strike there is little or no evidence except for the hole in the ground. People are even asking whether the air force missed the target, although in a muted fashion since to question is to be labelled anti-national these days. Pakistan stole the credit by immediately agreeing to release the Indian pilot who was shot down but downed a sophisticated F16 American fighter aircraft. In the first place the Goa government should not have used the land or sand on the beach next to the Bandodkar samadhi for the cremation of Manohar Parrikar. This is a violation of the Coastal Regulation Zone Act and it is not known if permission was taken. Similarly the State government apparently had not consulted Minister for Culture Govind Gaude before keeping Parrikar’s body at the Kala Academy for public homage. Even more strange is that a ‘shuddhikaran’ (cleansing) ceremony was held at the spot where the body was kept. We do not know whether this was done for medical reasons to prevent infection which seems ridiculous. During his life time when he had pancreatic cancer nobody was allowed to go near Parrikar out of fear of infection — fear that he would catch some infection, not that anyone could catch pancreatic cancer from him. The only other explanation is that the presence of a dead body in a government office like the Kala Academy is a bad symbol. Do the employees of the Kala Academy fear that the ghost of Manohar Parrikar will haunt them? Nobody knows who gave orders for the ceremony which could be considered as an insult to Parrikar. Minister for Culture Gopal Gaude initially condemned the whole deal of the ritual and then backtracked. Vinay Tendulkar, State president of the BJP, has ordered an enquiry into the incident. The BJP is trying to convert the death of Parrikar into an election campaign for the April 23 by-elections and Lok Sabha elections. The ashes of Parrikar were immersed not only in the Mandovi river but in every river and nullah in each of the 40 constituencies. Many condolence meetings have already been held and a mahacondolence meeting was held on Thursday, March 28, 2019 which was attended by Union Home Minister Rajnath Singh. No doubt a special condolence meeting will be held by the candidates contesting the election. The Election Commission should find out if use of the ashes of Manohar Parrikar for political purposes is in violation of the Election Code of Conduct. Even the appointment of two deputy CMs after the Code of Conduct was declared had been questioned by some social activists. And a few stray thoughts on the dropping of Sudin Dhavalikar from the BJP Cabinet and the split in the MGP Legislative party. As predicted, Babu Azgaonkar and Deepak Pawaskar decided to join the BJP. It may be recalled that after the 2017 election when the BJP got only 13 seats Nitin Gadkari managed to get the three MGP MLAs to extend support to the BJP. Nitin tried very hard to make Sudin the acting CM when Parrikar was alive, and full CM after the death of Parrikar instead of Pramod Sawant. The move was however rejected by Amit Shah to whom Parrikar had conveyed his objections to Sudin Dhavalikar becoming CM. Even so, Sudin could have been CM if he was willing to join the BJP. But his brother Deepak Dhavalikar, desperate to become an MLA and minister, would not agree to merge the MGP with the BJP. Unfortunately for Sudin, the two other MGP ministers, Babu Azgaonkar and Deepak Pawaskar, were willing to join the BJP. Since the MGP has only three MLAs, the two MLAs merging with the BJP is considered legally valid as 2/3rd of the members of the Legislative party have joined the BJP. Sudin Dhavlikar tried his best to persuade the BJP high command to permit Deepak Dhavalikar to contest the Shiroda seat against Subhash Shirodkar initially. Later Sudin gave in writing to Amit Shah that if he was made deputy CM his party would not contest the by-election and the two Lok Sabha seats. Deepak Dhavalikar however has been insisting that if he is not allowed to contest from Shiroda then the MGP will break away and contest all five Assembly seats and the two Lok Sabha seats. The poor victim in the battle between the brothers has been Lavoo Mamledar, general secretary of the MGP who objected to the MGP not contesting the Assembly seats. An angry Sudin Dhavalikar had him expelled from the party for six years for “anti-party activity”. It is basically a battle between the Dhavalikar brothers in which the party has been caught. Deepak was defeated by Govind Gaude, Minister for Culture from Priol in the 2017 election. He is desperate to become an MLA and get a kodel as minister like his brother. Sudin realized that if Deepak does not drop out of the Shiroda race the BJP may sack him from the deputy CM post and tried to see that would not happen but Deepak Dhavalikar did not cooperate. The BJP government will not be affected as Babu Azgaonkar was happy to merge with the BJP to retain his kodel and Pawaskar will be given a place in the Cabinet in place of Dhavalikar who was removed as deputy CM. The tragedy of the MGP is that the leaders have always let it down. The MGP still has a large number of cadres and is very popular with the Bahujan Samaj who identify with the lion symbol connected with the first CM Dayanand Bandodkar. Unfortunately, all its leaders, including Bandodkar’s daughter, Sashikala, betrayed the party. Sashikala, very arrogant and corrupt, even joined the Congress. The leaders of the MGP, a party which got 14 seats out of 30 in the first election after Liberation, have mutely witnessed the collapse of the party. 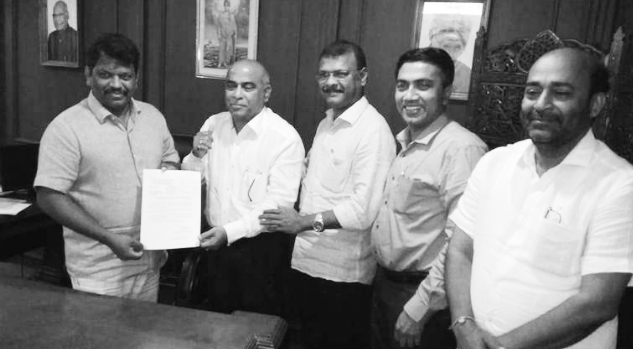 First Ramakant Khalap quit the party with six MLAs and formed the PDF government under the chief ministership of Churchill Alemao. The government was toppled by Dr Wilfred D Souza who cleverly offered the chief ministership to the leader of the remaining six MGP MLAs. So much so a party which got 18 seats out of 40 seats in the first election after statehood, was left with no MLAs. Sudin Dhavalikar is not qualified to be a leader of the MGP because he is Brahmin and not a member of the Bahujan Samaj which MGP represents. The MGP split will affect the outcome of the by-elections. And a few stray thoughts on Babush Monserrate becoming the king-maker if he contests and wins the Panjim elections. Babush already has a group of five MLAs who would be willing to resign from their parties to support him — Tony Fernandes from Santa Cruz, Francis Silveira from St Andre, Isador Fernandes from Canacona, Pandurang Madkaikar from Cumbarjua and Babush’s wife Jennifer from Taleigao. So if Babush wins there will be a group of six. I understand that Babush also has plans to put up candidates in the four other constituencies where by-elections are being held. He has the money power and the muscle power to win the four seats which will take his score to ten in the Assembly. With some support from GF president, Vijai Sardesai, Babush may even become the chief minister. The only chance of stopping Babush is perhaps Utpal Parrikar contesting and winning the Panjim Assembly seat. Besides controlling the parts of Taleigao which are part of Panjim Assembly, Babush also is in charge of the CCP. Panjim has a huge migrant vote bank which will vote for anybody who bribes them the most. Babush has shocked both the BJP and the Congress not to mention the Goa Forward by insisting on contesting as an Independent. While other candidates keep begging for a ticket, in the case of Babush it is the parties which want his support as he can make MLAs do the bhangda and shift from party to party with his huge money power. And a last stray thought on villas in Goa being bought by NRIs (see Emgee story pg 5) for 10 crore. This is a mini-Aldeia De Goa which has been put up in Siridao. It’s a super luxury complex of 12 villas for the bold and the beautiful and the rich and the famous which will have a swimming pool, CCTV, a pantry to serve lunch, dinner and breakfast and comes furnished with top luxury products. Originally, it was claimed that the property belonged to the Dempos. Subsequently this claim was challenged by a Catholic gentleman whose family had settled in Portugal and had all the papers showing that they were the real owners of the property which the Dempos had taken from them. We do not know who sold the property to EMGEE, which has dozens of construction projects in Goa, including in Dona Paula and Taleigao. Earlier there was controversy over an EMGEE project in Goa Velha for violating the CRZ zone. According to the judgment we’ve reproduced, EMGEE sold Villa No 12 at10 crore to an NRI even though they had not secured permission for construction of villa 12. Fortunately for the lady who had paid an advance of 1 crore the Consumer Court has ordered that the deal was illegal and the lady has been cheated. The Consumer Court has ordered EMGEE to return the money with interest. The larger question is to whom the property belongs to and who are the people willing to invest10 crore to buy homes in Goa. Previous post: Sedition For Dancing!